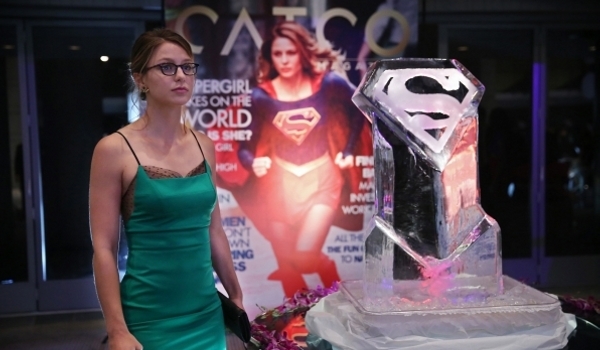 "Fight or Flight" is a hit-or-miss third episode to the series as Kara (Melissa Benoist) struggles both with her boss' mean-spirited expose of the city's new heroine and the arrival of one of Superman's enemies Reactron (Chris Browning) who hopes to take down the Girl of Steel in order to teach Superman a lesson. The conceit of Supergirl is that Kara lives in a world where she's just as good (but not really) as a more experienced and more seasoned hero with the exact same power set who she can't interact with or learn from on-screen. As with the "Pilot" episode, a blurred version of Superman does make an appearance to help Supergirl out of a jam but lets his younger cousin fend for herself against a rather lame villain who seems far less unstoppable than we're meant to believe. The episode makes time to loop in the DOE into Supergirl's latest villain encounter, although the subplot of the government agency having to be forced to help take down a man capable of leveling a city because he's technically not a super-powered alien doesn't make a hell of a lot of sense. After a cameo in last week's episode, Peter Facinelli is given a larger role as Maxwell Lord in this episode when he's kidnapped by Reactron to help stabilize the super-villain's nuclear-powered suit. Other than being a smarmy schmuck, it's still unclear as to what motivates this version of the comic character and whether or not he will eventually turn out to be friend or foe to Supergirl. I like Calista Flockhart, but Cat Grant is coming off more shrill and one-note in each episode and the internal politics of the most powerful woman in the planet schlepping for a bag of hot air isn't strong enough for the amount of plot that premise is forced to carry every week. And, to no one's surprise except for Kara, we learn Superman’s black friend James "Don't Call Me Jimmy" Olsen (Mehcad Brooks) has a girlfriend (Jenna Dewan Tatum) adding a love triangle angle to the shaky workplace drama that continues to be one of the show's weaker aspects although the interactions between Kara and Alex (Chyler Leigh) continue to be a strength the show should be able to build on.